becomes clear through comparison of two representations of the Crucifixion. 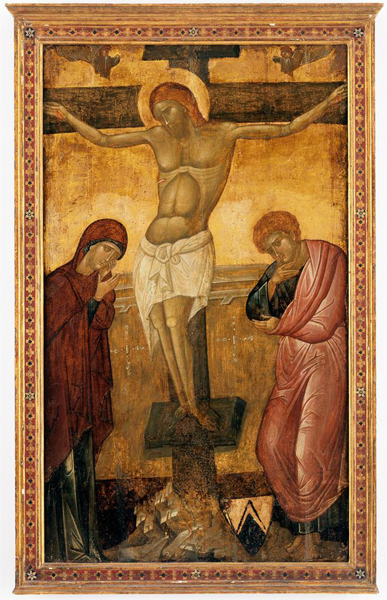 The version by an unknown Venetian artist working in the Byzantine mode exhibits a high level of abstraction that removes the scene from earthly identification. The schematic treatment of Christ’s anatomy suggests a geometric pattern rather than a flesh-and-blood human being. Similarly, with their stiff gestures and masklike facial expressions, the Virgin Mary and Saint John the Baptist appear as abstract symbols of grief, not heartbroken mourners. 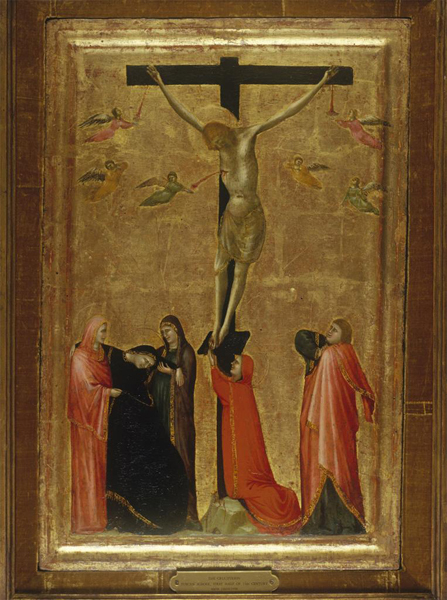 The other version of the Crucifixion, by an unknown Tuscan painter, emphasizes the physical reality and bodily suffering of Christ, whose body sags beneath its own weight. His head rolls forward, his arms appear in danger of dislocating from the shoulders, and his belly swells out from his emaciated chest. Weeping and swooning beneath the cross, the mourners react to the martyred figure and one another in a convincingly emotional manner that calls on our sympathy and establishes the image as a lifelike narrative rather than a static icon. The verisimilitude of the scene likens the divine and miraculous to our own human experience, reducing the distance between the sacred and the mundane.